Muffins come in many sizes, ranging from giant 5-oz. bakery muffins to small pastries made from mixes in your kitchen. English muffins are smaller than their American counterparts and they offer slightly fewer calories. Betty Crocker offers an apple cinnamon mix under the label Fiber One. One prepared muffin has 160 calories and 2.5 grams of fat. Pillsbury has a regular muffin mix that provides 160 calories in one prepared muffin and 4.5 fat grams. The Martha White apple cinnamon mix contains 150 calories in one prepared muffin and 4 grams of fat. Panera Breads bakes a 5-oz. muffin, Apple Crunch, that contains 470 calories and 12 grams of fat. Starbucks' Apple Bran muffin is 4.3 oz. and has 350 calories and 9 grams of fat. The American-style muffin is large and cake-like, while the English counterpart is flatter and more similar to toast. A 2-oz. serving is a complete muffin. 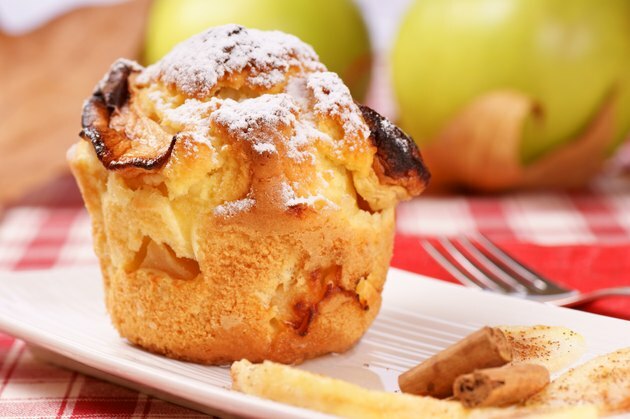 An English apple cinnamon muffin has 137 calories in a 2-oz. muffin as well as 1 gram of fat.